Logs, Logging, And Logger (Oh My)! Apple has a number of different logging APIs. For the past few releases, Apple has tried to capture everything possible in logs, creating what many administrators and developers might consider to be a lot of chatter. As such, an entirely new interface needed to be developed to categorize and filter messages sent into system logs. The logger command is still used to create entries in system logs. However, if you are then using tail to view /var/log/system.log then you will notice that you no longer see your entry being written. This is because as the logs being created in macOS have gotten more complex, the tools to read and write those logs has gotten more complicated as well. Let’s take a simple log entry. Below, we’ll write the string “Hello Logs” into the system log. To do so, use the –i option to put the process id of the logger process and –s to write to the system log, as well as to stderr. To make the entry easier we’ll tag it with –t followed by the string of the tag. And finally, we’ll quote the entry we want written into the log. This is basically the simplest form of an entry: logger -is -t krypted "Hello Logs" Once written, use the log command to read your spiffy new entries. This isn’t terribly different than how things worked previously. If you’re a developer, you will need to note that all of the legacy APIs you might be using, which include asl_log_message, NSLog, and syslog, have been redirected to the new Unified Logging system, provided you build software for 10.12 (you can still build as before for 10.11, iOS 9, tvOS 10, and watchOS 3 and below). These are replaced with the os_log, os_log_info, os_log_debug, os_log_error, os_log_fault, and os_log_create APIs (which correspond to various levels of logs that are written). 2017-03-23 14:01:43.953929-0500 localhost authorizationhost: Failed to authenticate user <admin> (error: 9). To put these into context, let’s use one in an example. Thus far my most common as been a compound search, so matching both patterns. Here, we’ll look at the WirelessProximity subsystem for Bluetooth and we’ll look at how often it’s scanning for new devices, keeping both patterns to match inside their own parenthesis, with all patterns stored inside single quotes, as follows: log show --style syslog --predicate '(subsystem == "com.apple.bluetooth.WirelessProximity") && (eventMessage CONTAINS[c] "scanning")' --info --last 1h Developers and systems administrators will find that the Apple guide on predicate programming, available at https://developer.apple.com/library/prerelease/content/documentation/Cocoa/Conceptual/Predicates/AdditionalChapters/Introduction.html, to be pretty useful if you’re doing lots of this kind of work. 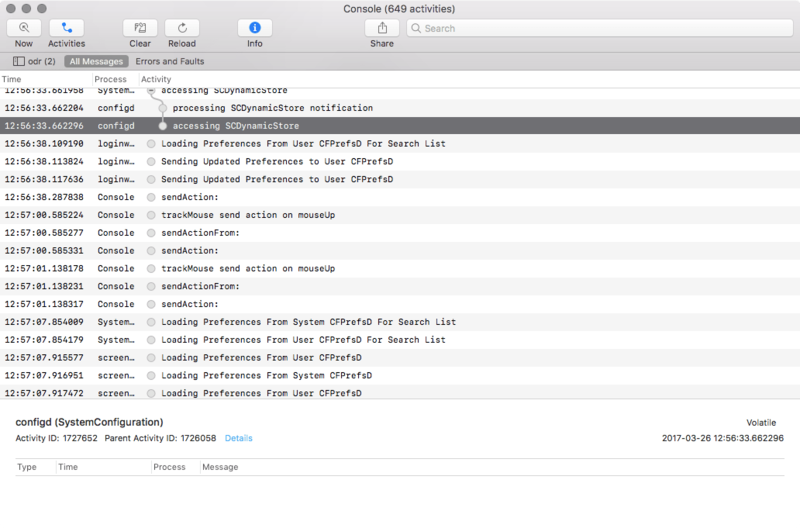 Note: sysdiagnose, a tool long used for capture diagnostics information to include in bug reports, is still functional, and now includes Unified Logging information, so Apple developers can get a complete picture of what’s going on in systems. Ultimately, the new Unified Logging is a bit more complicated than the previous options for both creating and reading logs. But once you get used to it, you’ll log it – I mean, love it. I find that I use less grep and awk and get more concise results. I also like the fact that the same code is useable with all four platforms, so learn once and re-use across devices. There’s a lot of information out there, but I had to go hunting around. Hopefully having a number of links and a the structure used in this article makes it easier to learn how to use all these new new little toys! Good luck! This is the first page of a 5 page piece I just finished writing for MacTech. After the last episode of the MacAdmins podcast though, I wanted to go ahead and get some of the information out there. For a much more detailed analysis, check out MacTech! Apple has a number of different logging APIs. For the past few releases, Apple has tried to capture everything possible in logs, creating what many administrators and developers might consider to be a lot of chatter. As such, an entirely new interface needed to be developed to categorize and filter messages sent into system logs. For example, to write an alert entry (everyone should see this): logger -t myscript -f ~/froggerlog -p alert To write a debug log: logger -t myscript -f ~/froggerlog -p debug The alert log is shown but the debug is not. Levels 5-7 are not displayed using a tail of system.log. If you need to verify success or failure of entries, note that logger exits 0 on success but not when an error is encountered. If you’d like to output entries to standard error, you can do so by adding the -s option as well.